Commissioning a portrait painting is a significant undertaking. A portrait will last for generations. Allen Polt always strives to create an heirloom quality portrait masterpiece of the highest standards. 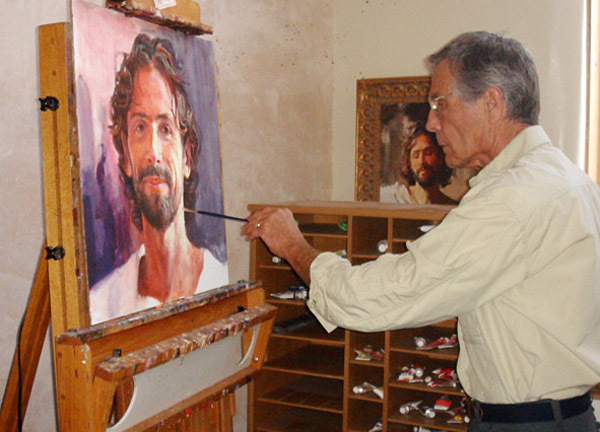 Allen Polt’s goal is to create the most beautiful oil portrait commissions possible. The first step is to talk about the specifics of your portrait. This initial discussion is an opportunity to get better acquainted. Since a commissioned portrait is collaboration, the overall idea, size and the wall location for display will be discussed. Clothing, props and background setting are also considered. Whether at Allen’s art studio in Taos, New Mexico, or at your location, Allen will take many digital photographic references of the subject for use in the creation of the portrait. Once the painting is completed, it is important that the painting is properly framed. The proper frame enhances the portrait. Although you are responsible for the cost of the frame, Allen can assist you in selecting the best possible frame. If desired, the completed commissioned portrait can be delivered framed and ready to be displayed for years of pleasurable viewing. Please be aware that the pricing is based on having the subject come to Allen’s studio; travel expenses, framing costs, shipping and insurance fees, state or city sales tax, where applicable, are additional. Fees are quoted in U.S. Dollars and available upon request at polt@taosnet.com. A 50% deposit is required upon commission agreement. Upon completion and delivery of portrait, and when it meets your approval, the balance is due. Please contact Allen Polt at your convenience to begin the process of creating your portrait.